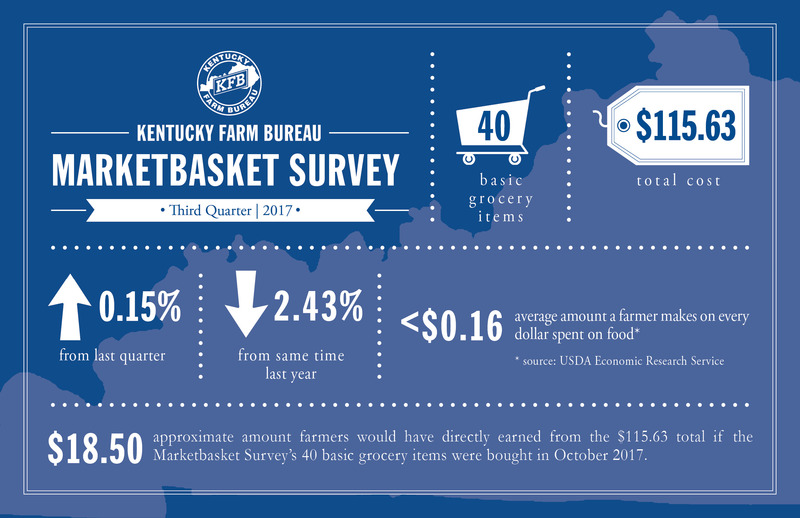 LOUISVILLE, Ky. – Kentucky Farm Bureau’s (KFB) latest Marketbasket Survey indicates food prices have remained steady since the beginning of the year. This is in contrast to what was seen throughout 2016. Quarterly measures indicated decreases in the 40 basic food items which make up the survey throughout most of last year and carried over into the first quarter of 2017. This third quarter increase of just .15 percent or $.17 is a minimum rise especially compared to the 1.76 percent drop in prices realized during that first quarter of this year. The total cost of the 40 surveyed items was $115.63. Nationally, the American Farm Bureau Federation’s Fall Harvest Marketbasket Survey also indicated a much higher rise in food prices to the tune of three percent or $1.43 for its 16 surveyed food items. The latest Consumer Price Index (CPI) showed a small overall food index increase of 0.1 percent in August, this after a 0.2 percent increase last July. With that said, the food-at-home CPI index saw a 0.2 percent decrease in August, with five of the six major grocery store food group indexes falling. Those included the index for meats, poultry, fish, and eggs fell which dropped 0.2 percent. The index for fruits and vegetables also declined slightly. Leading the way in Kentucky food price increases were beef with a 4.43 percent jump; pork, which increased by 0.90 percent; and poultry which saw a rise in price of 3.78 percent. Notable price decreases came by way of the fruit and vegetable sector with a decline of 3.56 percent and grains which posted a drop of 7.13 percent. The price for T-bone steaks increased by $1.26 per pound; bacon prices increased by $0.36 per pound; large eggs increased by $0.10 per dozen; and a pound package of pork chops increased by $0.45. Milk prices fell in the third quarter by $0.32 per gallon for whole milk and $0.26 for two percent milk; a 32 ounce bottle of corn oil dropped by $0.41 while a loaf of wheat bread fell by $0.18. Whether or not U.S. grocery prices fluctuate from one quarterly survey to the next, Kentuckians and all Americans continue to enjoy some of the lowest food prices in the world. Shoppers in the U.S. spend only about seven percent of their disposable income on food each year. Those costs remain far lower than any other country in the world thanks to many of the agricultural efficiencies utilized in America. Today the average U.S. farmer produces enough food and fiber to provide for about 154 people – a significant jump from an average of 19 people per farmer back in 1940.